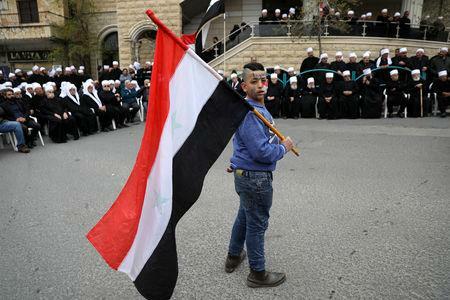 MAJDAL SHAMS, Golan Heights (Reuters) - Dozens of Druze Arabs, some carrying Syrian flags and pictures of Syrian President Bashar al-Assad, gathered on the Golan Heights on Saturday to protest U.S. President Donald Trump’s support for Israeli sovereignty over the territory. The mountainous plateau was part of Syria until Israel captured it in the 1967 Middle East war, annexing it in 1981 in a move not recognized internationally. Israel regards the Golan as a strategic asset because its peaks overlook northern Israeli towns and southwest Syria, where battles from an eight-year civil war have raged in view. Some 22,000 Druze, an Arab minority who practice an offshoot of Islam, live in the Israeli-occupied Golan, and many still have relatives on the Syrian side of the fortified boundary. 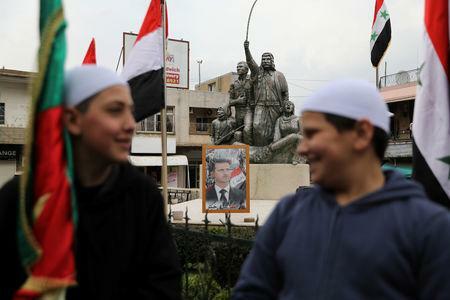 "This land has sovereignty and its sovereignty is the Syrian Arab Republic," said local resident Rafiq Ibrahim, dressed in traditional Druze black garb, in the town of Majdal Shams. Trump on Thursday said it was time to recognize Israeli sovereignty over the Golan Heights, marking a major shift in U.S. policy. 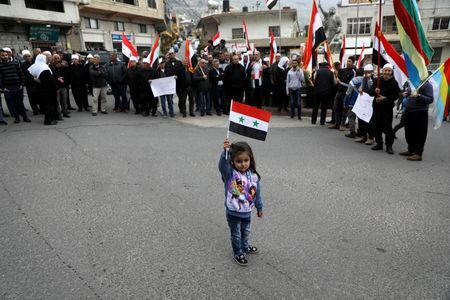 Syria pledged to take back the territory and there was widespread international criticism of the U.S. move.